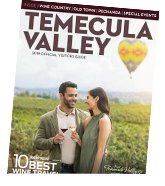 Temecula Valley Southern California Wine Country is a region alive with theater, public art, live music and art festivals year-round. Between culinary arts, Shakespeare in the Vines and live music, our vibrant wine country offers entertainment well beyond wine tasting. Don't miss world-class jazz, rising-star country acts, rock, R&B and more, playing in winery tasting rooms and on spacious patios.